by Matthew E. K. Hall. New York: Cambridge University Press, 2011. 248 pages. Hardback $95.00 ISBN 9781107001435. Paperback $29.99 ISBN 9781107617827. Reviewed by Joseph Daniel Ura, Associate Professor, Department of Political Science, Texas A&M University. jura [at] pols.tamu.edu. 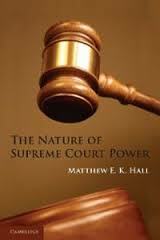 Matthew E. K. Hall’s THE NATURE OF SUPREME COURT POWER is a creative and important contribution to our understanding of the influence of the Supreme Court on American public policy and society. Hall recasts the classic debate over whether the Supreme Court influences policy outcomes as a question of “when is the Supreme Court powerful, and when is not?” (p. 4). He argues that the Court’s decisions can have substantial consequences for policy when they can be directly implemented by courts or when public opinion creates pressure on elected officials to act in support of the Court’s decisions. Hall tests these assertions by evaluating the influence of fifty-nine Supreme Court decisions on more than two dozen policy domains, finding substantial support for his thesis. The result is a powerful and convincing study that offers a serious challenge to prominent claims that the Supreme Court is essentially unable to influence political outcomes in the United States (e.g. Rosenberg 1992, 2008). Hall’s book is a new classic that unsettles the conventional wisdom about the Supreme Court’s (limited) influence on American life and promises to energize a new generation of research on the scope and nature of the Supreme Court’s political power. Hall’s study is motivated by two key theoretical premises. The first is that there is a critical distinction between decisions that can be implemented directly by lower courts and decisions which require the support or acquiescence of other actors. Hall refers to the policy areas implicated in the first set of decisions as “vertical” issues and those in the second set as “lateral” issues. He argues that vertical decisions are more likely to influence policy outcomes than lateral decisions. Though this claim is intuitive in retrospect, Hall is the first to offer the insight or exploit its theoretical implications. The second is that public opinion in support of the Court’s decisions pushes legislatures and executives to implement policy changes on the Court’s behalf when courts are unable to do so directly, i.e. in “lateral” policy spaces. Here, Hall adopts a classic claim about the importance of public opinion for ensuring that legislatures and executives respect judicial decisions as well as the institutional integrity of courts. Likewise, his work joins an important stream of contemporary research showing how public opinion balances separation of powers systems in the United States (Clark 2009; Knight and Epstein 1996; Ura and Wohlfarth 2009) and elsewhere (Helmke 2010; Staton 2010; Taylor-Robinson and Ura 2013). Though these two claims are relatively simple, they provide a lot of new analytical leverage. In particular, Hall [*217] hypothesizes that judicial policy impact is more likely when the Supreme Court issues a decision in a vertical policy area or the public supports its ruling in a lateral issue area. Conversely, he argues that judicial impact is less likely when the Supreme Court makes an unpopular decision in a lateral issue area. The book’s subsequent empirical analysis is organized around examining the Court’s impact in each of the four categories of decisions created by Hall’s distinctions between vertical and lateral issues and popular and unpopular decisions: popular vertical decisions, unpopular vertical decisions, popular lateral decisions, and unpopular lateral decisions. He analyzes the effects of “important” cases he identifies in end-of-term write-ups of the Court’s decisions in the New York Times and Washington Post and Goldman’s (2005) list of canonical Supreme Court decisions in which the Court invalidated a federal law or a set of state laws. His general strategy is to code decisions into analytical categories, identify outcome variables that ought to be directly influenced by Supreme Court decisions, and conduct a quantitative case study of the direct influence of decisions on those outcomes. In implementing this approach, Hall marshals and organizes an impressive body of evidence to evaluate his claims. Though the question of judicial impact is often complex and ideal data is sometimes lacking, Hall’s analysis convincingly shows that the Court’s influence over policy outcomes is consistent with his theoretical predictions. The scope of Hall’s analysis is impressive, covering scores of cases in twenty-seven policy areas. I note in particular Hall’s analysis of the impact of ROE V. WADE (1973) on legal abortion (which Hall classifies as an unpopular vertical decision), BAKER V. CARR (1962; a popular lateral decision), BROWN V. BOARD OF EDUCATION (1954, an unpopular lateral decision), though, which provide some of the sharpest evidence of the Court’s policy impact and the value of Hall’s theoretical framework. For ROE, Hall predicts that the Court would have a substantial direct impact since its ruling can be directly implemented by lower courts refusing to allow the prosecution of physicians who perform abortions. This should be evident in an increase in legal abortion in states where abortion had been illegal prior to ROE. The number of legal abortions in states that had heavily regulated or banned abortions prior to ROE was nearly five times greater in the year after ROE than the year before it. Conversely, the number of abortions in states that had lightly regulated abortion prior to ROE actually dipped after the decision as a greater number of women were able to obtain legal abortions in their home states where they had previously been prohibited. Hall’s careful analysis provides clear evidence of judicial influence on abortion policy that is consistent with his theoretical claims. Hall also shows the Court’s ability to influence policy outcomes even when it cannot implement decisions directly so long as public opinion backs the Court. This pattern is evident in the effects of BAKER V. CARR, which held that legislative districts must be apportioned according to population. Though lower courts could not directly implement BAKER, the decision enjoyed strong [*218] public support. Thus, Hall predicts that the decision would have a substantial impact on legislative apportionment. Consistent with this expectation, BAKER and subsequent decisions extending its principles to congressional districts were responsible for a massive decrease in legislative malapportionment. For example, the average percent population difference between the largest and smallest districts in the states fell from about 90% in the decade preceding BAKER to less than 30% by 1968 and less than 3% by 1974. Though less prominent in the judicial impact literature than abortion or school desegregation, the Court’s decision in BAKER and related cases was – consistent with Hall’s theoretical claims – a great success in eliminating legislative malapportionment and has had significant consequences for elections and policy outcomes at the state and federal levels (e.g. Cox and Katz 1999; Ansolabehere et al. 2008; McCubbins and Schwartz 1988). Hall’s analysis of the impact of BROWN V. BOARD OF EDUCATION shows both the limits of the Court’s power to directly influence policy outcomes beyond the reach of courts and the power of public sentiment to motivate policy change consistent with the Court’s rulings. Hall codes BROWN as an unpopular lateral decision and predicts that the Court’s decision to invalidate state laws requiring segregation in public education will have little impact on the composition of public schools. He shows that this prediction is born out in the Deep South. “As late as the 1963-64 school year, less than 2% of African-American students in these states attended school with white students” (p.129). However, in the Border States, which had also operated segregated schools prior to BROWN , the decision met with more public support and was followed by significant if limited change. “Of the 97.1% of African-American students in the Border States in segregated schools before BROWN, 37.8% of this group attended schools with whites during the 1956-57 school year” (p.129). Again, the history of school desegregation is consistent with Hall’s claims that the Supreme Court’s policy impact is conditional on both the availability of judicial mechanisms to implement its decisions and the political contexts in which decisions are made. Despite the book’s many triumphs, it is not without some weaknesses, many of which Hall acknowledges. Relevant policy outcomes are sometimes difficult to measure. For example, there are no reliable measures of courts suppressing statements made by criminal defendants who had not been advised of their rights during questioning by police after MIRANDA, forcing Hall to rely on less direct measures of the decision’s influence. Similarly, the survey data used to code decisions as popular or unpopular is often a poor match for the substance of the Court’s decisions. More generally, Hall’s decision to examine the Court’s influence across such a large set of cases forces a tradeoff between breadth and depth that is occasionally unsatisfying. I suspect that the book will prompt many others to examine the effects of particular decisions at greater length than Hall is able to in this book. In the end, though, THE NATURE OF SUPREME COURT POWER is a compelling contribution to the study of the Supreme Court’s influence on American life. It offers both a powerful theoretical [*219] framework for understanding how and when the Supreme Court influences public policy and a careful and convincing evaluation of the Court’s influence across a wide spectrum of policies. It is an outstanding book (it won the APSA’s C. Herman Pritchett Award in 2012, awarded for the best book on law and courts in the previous year) that deserves the attention of scholars of judicial politics, public law, and public policy. Ansolabehere, Stephen, Alan Gerber, and James Snyder. 2008. THE END OF INEQUALITY: ONE PERSON, ONE VOTE, AND THE TRANSFORMATION OF AMERICAN POLITICS. New York: W.W. Norton. Cox, Gary W. and Jonathon N. Katz. 1999. “The Reapportionment revolution and Bias in U.S. Congressional Elections.” AMERICAN JOURNAL OF POLITICAL SCIENCE 43 (3): 812-841. Clark, Tom S. 2009. “The Separation of Powers, Court Curbing, and Judicial Legitimacy.” AMERICAN JOURNAL OF POLITICAL SCIENCE 53 (4): 971–89. Goldman, Jerry. 2005. “The Canon of Constitutional Law Revisited.” LAW AND POLITICS BOOK REVIEW 15 (8): 648-656. Helmke, Gretchen. 2010. “The Origins of Institutional Crises in Latin America.” AMERICAN JOURNAL OF POLITICAL SCIENCE 54 (3): 737-50. Knight, Jack and Lee Epstein. 1996. “On the Struggle for Judicial Supremacy.” LAW AND SOCIETY REVIEW 30 (1): 87-120. McCubbins, Mathew and Thomas Schwarz. 1988. “Congress, the Courts, and Public Policy: Consequences of the One Man, One Vote Rule.” AMERICAN JOURNAL OF POLITICAL SCIENCE 32 (2): 388-415. Rosenberg, Gerald N. 1991. THE HOLLOW HOPE: CAN COURTS BRING ABOUT SOCIAL CHANGE? Chicago: University of Chicago Press. Rosenberg, Gerald N. 2008. THE HOLLOW HOPE: CAN COURTS BRING ABOUT SOCIAL CHANGE? 2 ed. Chicago: University of Chicago Press. Staton, Jeffrey K. 2010. JUDICIAL POWER AND STRATEGIC COMMUNICATION IN MEXICO. New York: Cambridge University Press. Taylor-Robinson, Michelle M., and Joseph Daniel Ura. 2013. “Public Opinion and Conflict in the Separation of Powers: Understanding the Honduran Coup of 2009.” JOURNAL OF THEORETICAL POLITICS 25(1): 105-127. Ura, Joseph Daniel and Patrick C. Wohlfarth. 2010. “An Appeal to the People: Public Opinion and Congressional Support for the Supreme Court.” JOURNAL OF POLITICS 72 (4) 939-56. BAKER V. CARR 369 U.S. 186 (1962). BROWN V. BOARD OF EDUCATION 347 U.S. 483. (1954). ROE V. WADE 410 U.S. 113 (1973). Copyright 2014 by the Author, Joseph Daniel Ura.